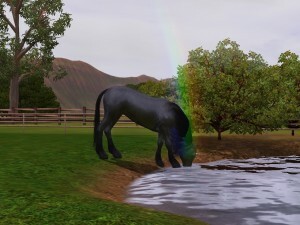 Mod The Sims - Not enough unicorns? Too many spawning? Finding a unicorn is hard. Some people can't find any, others find too many. Well I made this mod for those people. .33 chance of spawning a unicorn. 20 hour when spawning a unicorn. 5 hour when unicorn despawns. You can see why it's hard to find a unicorn. They don't always spawn! Well my mod helps with that. evenmore:-highest chance for seeing a unicorn! .99 chance of spawning a unicorn. 15 hour when spawning a unicorn. 7 hour when unicorn despawns. more:-little bit more of a chance for seeing a unicorn. .66 chance of spawning a unicorn. less:-very small chance of seeing a unicorn. .11 chance of spawning a unicorn. 23 hour when spawning a unicorn. 3 hour when unicorn despawns. Why less? Well there's always someone out there who wants less. These mods are for Pets! Do not use if you do not have Pets! Also, for game version 1.26/10.0. These mods alter the unicornpool xml file. They will conflict with any other mod that does this! There aren't any I am aware of at this moment that do this. Additional Credits: S3PE and The Sims Wiki for the image. evenmoreunicorns.rar | Description: Even more of a chance for unicorns spawning. moreunicorns.rar | Description: More of a chance for unicorns spawning. lessunicorns.rar | Description: Less of a chance for unicorns spawning.